1. 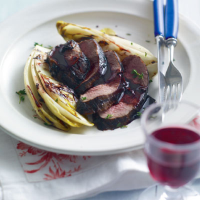 Place the venison steaks in a large bowl and pour over 1 tbsp each of the balsamic vinegar and red wine. Allow to marinate in the fridge for 1 hour. 2. Brush the chicory with 1 tbsp of the oil and cook on a hot griddle for 2 minutes on each side until softened. 3. Heat the remaining oil in a large frying pan and fry the venison for 12-14 minutes for medium, turning occasionally. Remove, set aside and cover to keep warm. 4. Add the thyme, remaining vinegar and wine to the pan and heat until the glaze is reduced by half. 5. Place 2 chicory halves on each plate. Slice the venison and arrange on top. Drizzle over the balsamic glaze and garnish with more thyme. Serve with a green salad and crushed new potatoes. Venison is full of flavour and a lean and healthy alternative to other red meat. Be inspired with more venison recipes at waitrose.com/recipes. These flavours deserve a red that’s elegant and intense with pure flavours and a savoury edge:Vinchio-Vaglio I Tre Vescovi 2008 Barbera d’Asti Superiore, Piedmont Italy.